In yesterday's ESPN Daily Dime, there was a survey asking if you would like to see the top 16 teams taken for the NBA playoffs, regardless of conference. Not surprisingly, 69% of the nearly twenty thousand people who responded said "yes" to the question. And logically, that makes sense. I mean, who wouldn't want to see the most qualified teams in the playoffs. However, as a member of the 31% minority, I would like to use this space to explain that while the 69% may be looking at the big picture, they are failing to see the whole picture. Now if we were to simply go with the top 16 records, the only things that would change would be Philadelphia and Atlanta out, Denver and Portland in. That's it. Those are the only changes. No sweeping alterations like taking 12 teams from the West as many would make it seem. There would be two teams out, two teams in. Division and conference alignments would be rendered meaningless in order to replace two teams unlikely to win a championship with two teams unlikely to win a championship. However, this is not even my biggest concern with this thought process. My dilemma comes from determining the top 16 teams. How do you judge the top 16 teams across conferences? I argue that you cannot simply pluck the top records and claim "Problem solved! We have the best teams!" The issue with the system is not that the wrong teams are making the playoffs. It's that the disparity in conferences is so great right now. I would argue that at least four teams in the East would fail to reach .500, much less the playoffs, if they were in the West. But this isn't reflected in the records, as I just showed above, with only two teams being swapped out. Why is this? Well, the answer to that is simple... The East plays the East and the West plays the West. Obviously, everybody who follows the sport is aware of this, but it is still a crucial point to make when arguing about the best 16 teams. How can you truly judge the premier teams when the level of competition is so markedly different between them? Would Atlanta still have the same record if they played 41 games against the West instead of 30? Wouldn't Portland be in a better position if they faced Miami four times instead of San Antonio? You cannot determine the best teams based on uneven levels of comparison. This season, wouldn't you consider a .450 team from the West to be better than a .550 team from the East? Yet in the 'Best 16 Records' approach, the team from the West would still be excluded from the postseason. Now you may be thinking that this is still a better approach than what we have now, that at least we'd still be including teams that are qualified for the playoffs and eliminating teams with no reason to even be involved in the discussion. But I argue that the system we have currently is actually MORE inclusive than the alternative and promotes competition among those who would otherwise have no reason to compete. If the NBA simply took the top 16 records, would Philadelphia have fought back from oblivion to reach .500 or just been satisfied with another year of rebuilding? Would Denver, Golden State, and Dallas be battling to the finish or would they be resting players knowing that their playoff positions were secure? Despite the fact that Eli and the Giants changed the whole "resting players" approach, I don't believe you would be seeing the same level of fight in some of these teams with their playoff lives at stake. And while you would be correct in stating that Portland and Sacramento would still be involved in races if we were to change the system, teams like Atlanta, New Jersey, Indiana, Chicago, and to some degree, Charlotte and Milwaukee, would have folded up ages ago knowing that there was no opportunity to reach the playoffs. Much like the wild card, it keeps hope in cities that would otherwise have none. And if you think that intentional tanking of the season is bad now, what would happen when a handful of teams are eliminated by the end of January? Although I hate seeing the Bulls struggle this season, I'd much prefer to see them compete (and I use the term loosely) than throw out something like what Miami has been lately. Much like it is after Selection Sunday, this is always a discussion during the season for the simple fact that they want the best teams included. However, much like March Madness, once those first few rounds are completed, the true challengers for the title come to the forefront. The weeks of exciting games make everybody forget who was the nation's 66th or 67th team, just like these playoffs will quickly make you forget who the 17th or 18th best teams were this season. It's also why the BCS will never be free of this debate, as there is no distraction between the bowl pairings and the championship game, but that's a debate for another article. In the end, I am not saying that I disagree with the thought that the most qualified teams should make the playoffs. But I do believe that it is a bit more complicated than merely taking the teams with the best records and thinking that solves everything. You must consider the imbalanced scheduling, the level of competition across leagues, and the possibility of discouraging several fan bases for the benefit of a few. Could discarding divisions and conferences ultimately prove beneficial to the league? Possibly, but in order to look at this big picture, you have to take into account the whole picture. For that 69%, that is apparently easier said than done. Although I follow football more closely and enjoy playing basketball the most, there is something about baseball that just draws you in. Perhaps it's the idea that spring is just around the corner (despite the fact it's snowing right now). Perhaps it's the camaraderie built with friends and strangers drinking beers in the stands. Perhaps it's the uniqueness of the individualistic team sport that you don't find anywhere else in American culture. Whatever the reason, every year I get sucked in, every year I try to plan another trip in my quest to visit all the stadiums (up to 16), and every year I try to make predictions on the upcoming season. However, unlike football, where teams are known to jump from worst to first, or basketball, where drafting a single player can change the course of a franchise in either direction, baseball appears to be more static. It's why the Braves can win 14 straight division titles. It's why the Yankees and Red Sox have dominated the AL East. And it's why the the Devil Rays have never even sniffed the playoffs. In retrospect, the first weekend brought us four overtime games, six others decided by 5 points or less, twelve upsets based on seedings, and of course, the knowledge that we will have a Duke-free remainder of the tournament. But as Mark McGwire would say, I'm not here to talk about the past! It's time to look forward and see what is going to happen in the coming weeks. Who has the best chance? Who should just be happy to be where they are? Let's take a look at the remaining 16 teams and try to sort this out. 16. Western Kentucky Hilltoppers - Sure, this team is a nice story, but the Sweet 16 is where Cinderella usually loses her glass slipper. And by glass slipper, I mean game... The Hilltoppers pulled out a dramatic win over mid-major Drake in round one, then took on fellow underdog San Diego in round two. They have yet to play a major conference team (although they'd most likely beat Illinois - sorry, back to looking forward...) and now go up against top-seeded UCLA. It's been a nice run, but I believe it stops here. 15. Villanova Wildcats - Perhaps the last team to make the tournament, the Wildcats are another example of why you should never go against your first instinct... Originally in my Sweet 16, the Wildcats have indeed made my non-prediction come true. The win over Georgia was solid, and they took care of business against Sienna, but now comes Kansas, who is always apt to choking but still a considerably better team than this Big East hopeful. As a vengeful Illini fan, I will be rooting for them. But truth be told, I can't see them pulling another win out. 12. 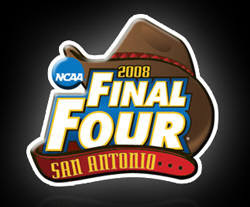 West Virginia Mountaineers - How about that Big East, huh? Eight teams in and only three made it to the Sweet 16. And who would have guessed that the Mountaineers would be one of those still standing? Oh yeah, that's right... me. But defeating an Arizona team that barely squeaked into the field of 65 and an overrated Duke team is more impressive in terms of my gratitude than of accomplishment. I think the Mountaineers have a better shot at reaching the Elite 8 than some of the teams I'm about to get to, but in the grand scheme of things, I think this is where West Virginia lies... solid performance for a 7-seed, but not in the top tier of remaining schools. 11. Xavier Musketeers - Why do I think West Virginia has a good shot at the Elite 8? Primarily because I have not been overly impressed with Xavier. I have Xavier making the next round, so they'll have my rooting interest, but thus far, they defeated Georgia, which had an unprecedented run simply to make the tournament but was still a .500 team, and struggled against Purdue, who is up-and-coming but still too young to see as a major threat in this tournament (and again, that whole Big Ten thing). I don't know what the line is, but I can see the Xavier-West Virginia game going either way, down to the wire, so it makes sense to rank them together as well. 9. Washington State Cougars - Here is another team that I'd like to rank higher but don't know who else to move down. While their Pac-10 colleagues were eking out last second wins, the Cougars soundly handled Notre Dame on Saturday, a team that I expected to see in the Sweet 16. Of course, a little luster was taken off the win after watching most of the Big East crumble, but it got to the point where I stopped paying attention to the game, something that typically only happens during blowouts. The biggest problem they face now, however, is that whole North Carolina thing that's staring them in the face. 7. Wisconsin Badgers - I tend to disrespect the Big Ten often, but that's what happens when the conference, shall we say, fails to live up to expectations. While the Badgers were definitely the best of a bad bunch, I am waiting for the shoe to drop and purify this tournament from the plodding that is Big Ten offensive basketball. 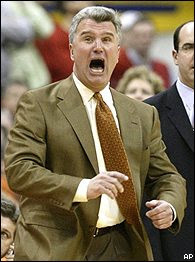 Nevertheless, I do have to respect Bo Ryan for what he's done with this team. Typically, the Badgers play solid defense and have one go-to guy on offense to carry them when needed. This year, they have the defense once again, but I don't know who will take over in the clutch, and in the month of March, you need that somebody. 6. Memphis Tigers - Before the tournament started, there were two sides to the debate regarding the Memphis Tigers. One side said that their free throw shooting would do them in. The other said that they were talented enough to overcome. I tended to side with the former, having the Tigers bow out in the Elite 8 of my bracket. After watching the end of the Memphis-Mississippi St. matchup, I'm going to stick with my gut and say they will be the first 1-seed eliminated. Conference USA, this is not. 5. Louisville Cardinals - Quite honestly, I did not know what to expect from the Cardinals before this weekend. I saw them reaching the Final 4. I saw them eliminated in the first round. So I settled with the round of 16, and thus far, my prediction is accurate. They have crushed both Boise St. and Oklahoma, although I don't consider either of those as signature wins. Nevertheless, the team is playing well, and you cannot underestimate Rick Pitino come tournament time. They'll be ready for the Volunteers. 4. UCLA Bruins - My pick to win the championship before the tournament, the Bruins put a significant fright in me on Saturday, trailing for nearly the entire game until eventually putting it together against Texas A&M. Looking back through the season, the Bruins have had quite a few scares. However, like good teams do, they have pulled them out, just as they did this weekend. They have the talent and have shown that championship-caliber play throughout the season, so I'm not dropping them too far. But with that being said, they need to get their act together and find something to rely on other than Kevin Love and his 7 blocks... Hopefully, for my bracket's sake, Western Kentucky proves to be the remedy to whatever is ailing this team. 3. Tennessee Volunteers - First off, this is the third 'eers team in the Sweet 16, joining the Mountaineers and the Musketeers. I just found that interesting. Second, it pains me to think that my top three teams are all on my less-preferred list of teams. Regardless, the Volunteers proved something to me with their win over Butler. Sure, they struggled and were forced into overtime, but they managed to knock out a team that was way better than a 7-seed. I don't understand why nobody was talking about how the #10 team in the country got a 7-seed in this tournament. Butler is a solid, underrated team, and the Volunteers took the punch and then punched right back. That will be a great learning experience for this team going forward. 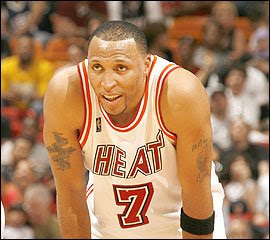 So Shawn Marion... how's that team leader thing going? I was preparing to write something about the Miami Heat and their abysmal season anyway, but when I saw "54" scroll across the ticker last night and realized I wasn't looking at a Big Ten score, I knew I had to mention something about this compilation of basketball players that were once known as the Miami Heat. 54. The Miami Heat scored 54 points yesterday in a game against Toronto, a solid team but not exactly a juggernaut, even in the East. How far the mighty have fallen - and more specifically, their newest member. Now I realize that Shawn Marion may just be biding his time until he opts out of his contract this offseason and hits free agency, but you have to believe that at least some part of him is disappointed he is where he is. The in-fighting was well documented. Amare Stoudemire and Shawn Marion each wanted to be a bigger star, yet there was only so much sky for the two of them in Phoenix. Marion, apparently looking at all the success Joe Johnson has had in Atlanta, even took pause when asked if he'd rather be a role player on a championship-caliber team or the leader - both on the floor and in the bank account - of a mediocre team. Despite the winning, something had to be done. Several thousand miles away, the Heat had their own issues. Dwyane Wade hadn't been healthy since their championship and the aging Shaquille O'Neal was on the books for two more years at $20M a pop. The salary structure of the team was built to compete, not rebuild. So the Heat and Suns decided upon one of the more questioned trades in recent memory. It had the surprise of the Pau Gasol trade, but with much more baggage. How would the Suns mesh with Shaq? Does this help the Suns or hurt the Suns? Are the Suns going to pay the big guy? What will Steve Kerr's legacy be after this all played out? Now I have no record of this, but when the trade went through, I thought it was a good move. I thought the Suns took a chance they needed to take. Steve Kerr showed his willingness to take risks, and if it didn't work, deep down you knew that he would take the risks necessary to bring the team back. But what nobody focused on was that Marion, after years of complaining, finally got his wish. He had his opportunity to shine brightly in the Miami sky. Of course, nobody would notice. And rightly so, because people just don't pay attention to losing teams. Nevertheless, it was what he wanted. It was what he needed. And it's costing him every day. Granted it's still a small sample size, but looking at the main principles of the trade, it seems to be working for 75% of the people involved. For the Suns, what began as a rocky adjustment period has slowly been evolving into what Kerr had envisioned. Now riding a 6-game winning streak, including a grind-out win against the Spurs and a run-and-gun victory against the Warriors, the Suns are 12-8 since the deal, 9-6 with O'Neal in the lineup. They sit a mere half game behind the top spot in the conference - nearly the same position from before the trade - and Shaq's presence has propelled Stoudemire to an impressive scoring run. The Suns appear to be figuring it out, with thanks to Shaq who has filled his role perfectly. Averaging a double-double for the first time since the '04-'05 season, Shaq is controlling his game, while shooting an impressive 62% from the field. If I were in the West, I would fear this team right now. They can run with you, or they can grind it out. While there is still a lot of season to go, this recent 6-game streak has to have Kerr smiling... and breathing a sigh of relief. On the other side of the country, Miami is also reaping the benefits of the deal. They managed to get O'Neal's money off the books to allow them to rebuild. They officially put Wade on the shelf for the rest of the season, maximizing their ping pong balls for this summer. It may not be pretty, but this is what the Heat were looking for in the deal as well. The hope is that they can keep Marion for their re-tooling this offseason, but even without him, they will have plenty of cap space and a solid draft pick to fill in the roster around Wade. Let's take a look at the numbers, shall we? Marion's stats are down nearly across the board. His scoring has dropped by 1.5 points. His shooting percentages are down significantly in all three categories. Blocks have nearly halved while turnovers have more than doubled. Nearly the only stat that has positively increased is rebounding, but a closer look shows only offensive rebounds have improved, which would make sense considering the increased amount of opportunities for those. Now would any player's stats drop on a team that would struggle to reach the NCAA Sweet 16 this weekend? Absolutely. But the real question is how much money is Marion losing with his newfound struggles? I know this is the NBA where somebody is always willing to overpay (see: Thomas, Isiah), but shouldn't this be a flag to GMs around the league? Without Steve Nash spreading the floor and creating open shots, Marion has struggled. And, rumor has it he's complaining once again, this time about lack of effort from his teammates. So for every game that goes by, Marion finds himself with declining statistics and more stories of alienating teammates. The losing itself will most likely drive Marion to opt out of his final year of his contract, but then what? Will he get the money he thinks he deserves? Probably, but I don't think it's as likely as if he had stayed with the Suns. Winning breeds success. Success breeds money. And all Marion had to do was keep his mouth shut for a few more months, make another deep run into the playoffs, and then taken his numbers to any team that could afford him. Not that it is all his fault, since he was not the only player in that locker room, but Marion's open talks about leaving - and his trade demand before the season - has brought him here. As he and the players around him barely squeaked by the half century scoring mark last night, you have to wonder if Marion is still blinded by dreams of dollar signs and the delusion of leadership, or if he has finally, thousands of miles from where he once called home, realized how good he had it. If he still needs convincing, he can just ask Shaq. With the demise of my Illini this season, my television focused less on college basketball these last several months than, say, pretty much anything else that was on... Now that they have officially been put out of their misery, it is time to put the injury-plagued and foul-prone career of Brian Randle behind and return my attention to the NCAA event that transcends any team affiliation - March Madness. Now while these may sound contradictory, there is a level of reason here. Every season, I scour over countless basketball games and compare incomparable statistics, attempting to discover some hidden secret that will give me the advantage over the other countless number of people also filling out their brackets. And in the end, I get a few upsets right, miss a few others, and have had a decent run at predicting the Final Four. When all is said and done, I have won more than I have lost. I do not consider myself an expert, but I bring a certain sense of logic to my selections. However, my lack of attention this season has left me with the realization that I am now one of those people this year. I am the relatively clueless one who couldn't name a single player on Sienna and has no idea how many turnovers Kentucky has per game. Granted, I don't believe I will ever reach the point of choosing teams based on average annual campus temperature, but I am not that far off this season. Perhaps this time, this year, the smaller climb when filling out my bracket will result in a softer fall come April. In the immortal words of George W. Bush (the Will Ferrell version), this is hard! With additional time on my hands, I believed that contributions to this page would increase. And in some senses it has. But for the most part, I have discovered that in searching for my voice, I first need to determine what I want to say... I have always considered myself more of a writer than a blogger, trying to evaluate and analyze the depths beneath the obvious surface. I felt I owed it to myself and all my non-readers to provide more information than just a series of quick hits or brief updates readily available on any news site. But the internet isn't exactly the place for slow and deliberate information. Countless news stories have come and gone, yet the thoughts in my head regarding each have remained just that... thoughts, never believing that I had enough information for a full-fledged posting. So, does that leave me as a writer trapped within a blog website, or does that make me a blogger without anything to say? That's my conundrum. Do I continue my steady pace and maintain a stream of long articles? Do I succumb to the blogger life of quick thoughts and quicker posts? Should I even be using the word 'conundrum' in a sports blog? These are the questions I have faced in the time since my last post. However, in these uncertain times, I can take solace in one familiar and comforting scenario. It's Big Ten Tournament time - the Illini must be in the semifinals. Sure enough, as I sit here, my Illini are indeed once again in the final four of the Big Ten, for the 10th time in the 11 seasons of the tournament. After suffering through what can best be described as a disappointing season (and can at worst be described by words I shouldn't use in either articles or posts), Bruce Weber and Co. have once again strung together a couple wins to make things interesting. After knocking off Minnesota for the second time this season - still not sure how that happened - to close out the regular season, the Illini squeaked out a last-second victory over young Penn State in the first round, then battled Purdue for 45 minutes before finally sending the Boilermakers to March Madness on a losing streak. You can't blame me for having thoughts of 1999 race through my head, when the 11th-seeded Illini won three straight tournament games after having won only three Big Ten games all season, and nearly crashed the NCAA party before finally losing to Michigan State in the championship game. Could it happen? Could this team somehow put together two more victories and make the tournament? For a few hours, it appeared that to do it, the Illini would have to once again go through Indiana, whom they have played tough, but finished on the short end of the scoreboard each time. (I won't even get into the Eric Gordon/Kelvin Sampson thing) But after Indiana's stunning loss in the quarterfinals, Illinois' path just got a bit easier. And lo and behold, who is this squaring up against my team in the semis? But let's just take a moment and reflect on this possibility. Illinois, as flawed as it is, has a legitimate shot of reaching the tournament. A team that has blown leads of all sizes this season... A team that cannot close out games... A team that goes cold for several minute stretches at least twice a game... A team that had no go-to guy until a late-season emergence of freshman Demetri McCamey, and even that is streaky at best... A team in which Brian Randle and all his athleticism has a seat ready for him when he inevitably fouls out... A team in which Chester Frazier stays healthy as well as he scores, neither a good thing... A team, if not for that pesky foul limit, you would actually consider fouling every time down the court knowing that that's essentially a defensive stop. And even then, I think I would still foul Shaun Pruitt. This team is a mere two wins away from post-season play. Apparently, that's why they call it March Madness. The Illini will be eliminated in the first round, but at least they had the chance to dance. From my vantage point, it's often difficult to observe the nuances within a basketball game. While Section 312 of the United Center offers an enjoyable perch to take in a game, it lacks the advantage of slow-motion replays or a courtside perspective. The intensity in the voice of the head coach, the subtle grabbing of jerseys in the low post, the eye contact between players on a developing fast break... All of these aspects of the game elude me as I peruse the action from the upperdeck. However, over the years, I have continued to follow the ups and downs of this team, compiling observations and formulating opinions from my bird's eye view. And one thing has become increasingly clear. Obviously, this is only regarding the game of basketball. I have never met Ben Gordon, nor have I heard stories that would sway my opinion of him as a person. But he isn't getting paid millions of dollars to be my friend. He's getting paid to play basketball. And in that respect, he's failing me miserably. Now, I will spare you the traditional complaints that are typically levied at this point. It is well documented that Ben Gordon's size and defensive abilities are a liability in the backcourt, creating mismatches for opponents and forcing Kirk Hinrich to expend his energy chasing opposing shooting guards. And with Ben Wallace's departure, the shivers in my spine are all the evidence I need to know that nobody on the Bulls frightens me more putting the ball on the floor than Ben Gordon. But no, the source of my frustration is in his supposed strength. Ben Gordon is failing me as a scorer. The main responsibility of a primary scorer, which is how Gordon sees himself, is to provide the team with not only a spark, but an anchor to lean on. However, box score after box score, Gordon finds himself all over the scoring spectrum. His supporters will describe this phenomenon by saying Gordon is "explosive" on the offensive end, able to catch fire and drain shots from any point on the floor. But one man's "explosive" is another man's "erratic". Personally, I like to call it volatility. And like any chemistry experiment, as every sports team is, volatility can prove disastrous to a team already teetering on the brink of a long off-season. So how volatile is Ben Gordon? That is what I wanted to find out. Charting the per-game point totals throughout the season, Gordon has amassed 951 points for an average of 19.4 points per game. Nothing too shocking. I then calculated the standard deviation for the data, a mathematical measure of statistical consistency. For Ben Gordon, the resulting standard deviation (stdev) was 8.8 points, or 45% of his per-game average (what I will call his volatility). Simply put, there is approximately a 68% chance that Ben Gordon will score 19.4 plus or minus 8.8 points in any given game. Of course, it is probably unfair to compare Gordon to these two players. After all, James and Bryant are battling it out for MVP honors this season. But I do find it interesting that Bryant, who is universally renowned as "explosive" displays a more consistent point total than Gordon, even with his frequent 40+ point games. Regardless, let's lower the bar from this lofty height and see what we find. How does Gordon compare to another undersized shooting guard (Allen Iverson) and the shooting guard I wanted the Bulls to draft two seasons ago (Brandon Roy)? Some of the variability seems to have been removed, but even a normalized Ben Gordon in his best season still provides less consistency than Jamal Crawford! And he doesn't seem to be improving. 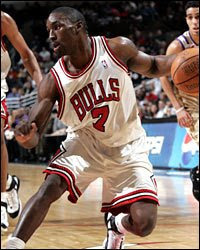 This is just who Ben Gordon is as a basketball player. And again, I have not even touched upon Gordon's defensive deficiencies or propensity for turnovers. This is purely an evaluation of his "strength". On a running team as a 3rd or 4th option (like Phoenix, perhaps), Ben Gordon could prove valuable. But to base your scoring on this undersized shooting guard is tempting the fates... you never know which Ben is going to show up. Fortunately, the likelihood that the other 29 GMs in the league read this blog is minimal at best, and it only takes one to believe Gordon is the missing piece to their championship puzzle. I hope John Paxson understands this and takes appropriate action this summer, spinning Gordon into a backup point guard, rebounder, or draft picks. Based on the numbers, there is only one way Ben Gordon can be counted on to help this team after this lost season: sign-and-trade.